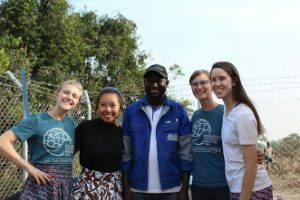 Eight students involved in Engineers Without Borders (EWB ISU), a student organization on campus, spent three weeks of winter break in Ullo, Ghana. In its fourth year visiting the village, EWB ISU focused on building a water distribution system that brought water to the school that serves over 1,000 students. EWB ISU members Anna Bilek, Emily Hou, Clare Lanaghan and Pagie Jewell pose for a photo with Dauda after a long day of work. “The wells just have a constant stream of people at them. Women and children spending their days by the wells collecting water, washing their clothes and stuff,” said Chris Nennig, junior in civil engineering. While EWB ISU worked in Ullo, they witnessed “Laundry Day,” a day all the students walked to the community borehole and spent hours in line waiting to wash their clothes. “They’d bring these 10-liter Jerry cans to the well and hand pump water to wash their clothes,” said Nennig. During the three weeks there, the group also installed solar panels to mechanize the Saamaalyiri Well, installed a water tank in the boys’ dormitory and prepped for the arrival of the water tank for both the girls’ dormitory and the kitchen. Throughout the past year, EWB ISU worked on creating a manual to leave behind to help troubleshoot any issues that may arise. For Nennig, this opportunity served as verification for his plans for the future.